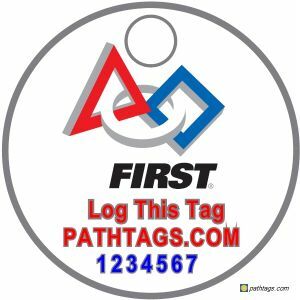 Welcome to the Pathtag page for Walton Robotics FIRST Robotics Competition (FRC)Team 2974! FIRST TEAM MEMBERS AND SUPPORTERS: If you received this PathTag necklace directly from a member of the Walton Robotics Team, you can help inspire an interest in STEM with people and kids all over the world by clicking on this link www.waltonrobotics.org/pathtag, where you'll learn about geocaching, a fun, outdoor recreational STEM game that has people all across the globe searching for hidden treasures using portable Global Positioning System (GPS) devices. By trading this Pathtag during just one geocaching adventure, you'll be helping to set in motion a domino cascade that educates people all over the world about STEM and FIRST. GEOCACHERS: If you have never heard of FIRST Robotics, never seen a robotics competition, you're in for a whole new, exciting adventure. FIRST: The acronym "FIRST" stands for "For the Inspiration and Recognition of Science and Technology," a nonprofit organization founded by famed inventor Dean Kamen to promote Science, Technology, Engineering, and Math (STEM) careers among young people. The vehicle for making this happen is a program of competitive robotics tournaments for children as young as Kindergarten through high school. K-8 students can participate in FIRST's LEGO League teams (Jr. FLL, FLL), while middle and high school teams build larger and more sophisticated robots on FIRST Tech Challenge (FTC) and FIRST Robotics Competition (FRC) teams. The key to the success of these programs is in the dedication of coaches and mentors in helping students learn so many things, from safe tool use, engineering design, creative problem-solving, research skills, and more. FIRST tournaments are marvels of creative engineering as teams work furiously during a 6-week build season to design and build robots that can perform amazing feats of engineering and programming. For example, in 2012, FRC teams design and built robots that to play basketball; the best could consistently sink shots from more than 30 feet away. In 2013, FRC robots played Ultimate Frisbee and climbed pyramids. In 2014, the robots worked together to launch large balls to human players and score goals. Learn more, including finding a team or competition (free admission) near you, at www.usfirst.org. Trade this pathtag with another geocacher either through an online trade or a geocache trade. Start a team. Demand for teams at all levels is high. This is especially true with FLL, where dozens of students are often turned away because of the 10-student roster limitation. A team does not have to be linked to a school. Volunteer as a team mentor (business or technical), volunteer, business sponsor. Find a team near you at http://www.usfirst.org/whats-going-on. Donate. Make a tax-deductible donation at www.usfirst.org/involved/donate to support this great program that is paving the way for a bright future filled for young people everywhere!